Make sure you enter her giveaway below for two great prizes: (1) a free annual subscription to her critique service, Rate Your Story, and (2) a signed copy of ONE PLASTIC BAG. The giveaway ends at noon EST, Jan. 22. ONE PLASTIC BAG tells the true story of Isatou, a Gambian woman who tackled the problem of plastic trash in her community by organizing women to recycle plastic bags into woven purses. Not only did she clean up her community and save goats from eating plastic, but she also empowered the women in her village. The story is told simply and lyrically. One of my favorite refrains that shows up in different variations, goes like this: “One plastic bag becomes two. Then ten. Then a hundred.” The repetition of this evocative phrase in different settings reinforces a central theme of the story – the actions of one person can multiply and reverberate well beyond themselves. The illustrations by Elizabeth Zunon are striking with a strong graphic sense. She creates bright and warm collages from plastic bags, African patterned cloths, photographs, and painted surfaces. How did ONE PLASTIC BAG come about? What sparked the idea? 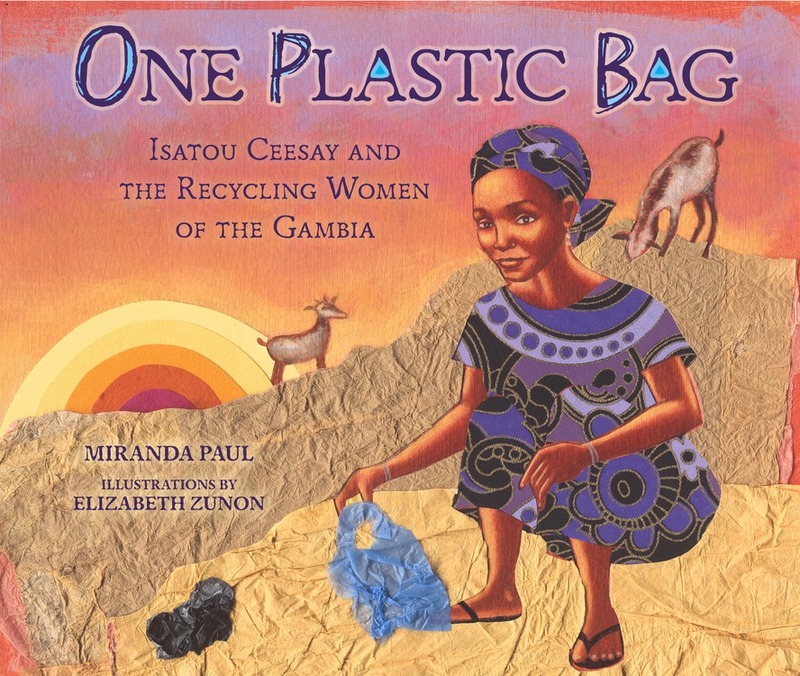 I was actually teaching for awhile in the Gambia, and learned of Isatou's recycling project. I've been an avid recycler since I was young. In fact, I got to explain more about how I came across this story in the Author's Note. What kind of research did you do when writing this story? A lot of primary research. Interviews, talking with people who were involved in it, and traveling to Gambia and staying in the village with the women many times. Since most of the women cannot write, photographs were limited, and the women went un-reported by their country's newspapers for years, research worked a little differently than other nonfiction books. I can say that I would not have been able to write this story without having lived there and/or been familiar with the Wolof language. What projects are you working on now? What books do you have coming out? Just a few months after ONE PLASTIC BAG comes out, I have another environmentally-themed picture book releasing. It's called WATER IS WATER, and it's illustrated beautifully by Jason Chin (GRAVITY, REDWOODS, ISLAND). The text of that one is spare, so it's great for really young audiences as well as school-aged kids. As for what I'm working on now, here's the rundown: I just finished up some back matter for a book called HELPING HANDS, which will be published by Lerner (Millbrook) in early 2016. I'm really excited for it because it's a game/book hybrid, and will be illustrated by the talented Luciana Navarro Powell. I have two other books coming out in 2016, one called 10 LITTLE NINJAS (Knopf/Penguin Random House) and another one that I hope to announce very soon. 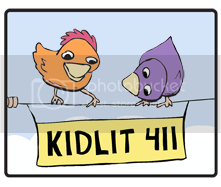 I'm also working on final touches for a humorous picture book that's coming out in 2017. Your webinar is about breaking the rules of picture book writing. Can you give us an example or two of what you mean? You know. THE RULES. Don't do this, Yes do that. Keep your manuscript under 500 words, no inanimate talking objects, don't write about something that actually happened to you, quiet books don't sell. We've heard them all. I think that sometimes, these rules can be confusing and/or stifling to new writers who are developing a voice. I try not to let them rule my writing, and many of my forthcoming books are outright rule breakers. ONE PLASTIC BAG is 833 words (plus back matter! ), and I just sold a book that's got talking inanimate objects -- one of the biggest no-nos in the biz. 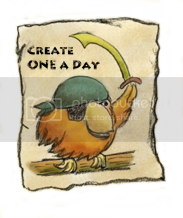 The webinar, Rules to Break to Make Your Picture Book, offered on January 24th through Children's Book Academy, will be a way for people to ask questions and find tips for gauging when to adhere to the rules, and when they might break them. Plus, there's an editor (Ariel Richardson, Chronicle Books) joining us who will chime in on this very topic! You critique a lot of PB manuscripts. What are the top few mistakes you see from beginner writers? Either ignorance and accidental rule-breaking, where I can tell the writer hasn't studied picture books at all, or writing too carefully so as to adhere to the rules - which can mean blandness, less originality, and being stripped of voice. What are the one or two top things you did to get to the point where you got publishing contracts? I wrote a pile of books, and read a mountain of books. The thing is, people write their way to publishing contracts. They don't network, pitch, or buy their way to them (ok, maybe some celebrities can). For us common folk, writing a great book and polishing it is the best thing we can do. Thank you so much, Miranda. I can't wait to check out the webinar, and congratulations on all of your successes! 1) A 1 year subscription to Rate Your Story (RYS). RYS is a service where professional authors critique and rate picture book manuscripts. RYS provides its services for free on certain days of the year and offers a paid yearly subscription for $180, that allows 20 manuscripts to be submitted at any time, priority review, and more. If you already are a RYS subscriber and win this prize, you will get a full refund of your annual subscription. 2) A signed copy of ONE PLASTIC BAG. Miranda Paul is a children’s writer who is passionate about creating stories for young readers that inspire, entertain, and broaden horizons. 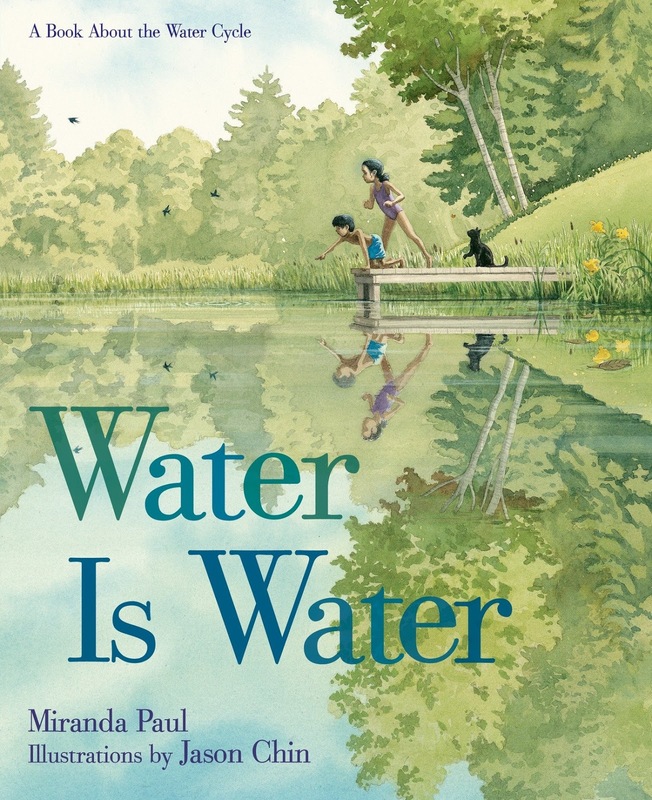 In addition to more than 50 short stories for magazines and digital markets, Miranda is the author of several forthcoming picture books from imprints of Lerner, Macmillan, and Random House. 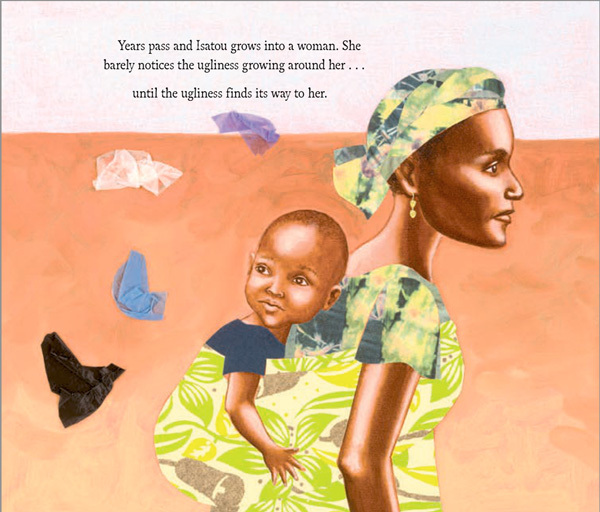 Her debut, One Plastic Bag: Isatou Ceesay and the Recycling Women of the Gambia, was named a Junior Library Guild Selection. She is the Executive Vice President of Outreach for We Need Diverse Books™ (www.diversebooks.org) and the administrator of RateYourStory.org, a site for aspiring writers. Miranda believes in working hard, having fun, and being kind. Learn more at www.mirandapaul.com. Fabulous information and a very cool prize. Wow! This book sounds wonderful. There really aren't many good picture books about the environment that are short enough for early primary grades. I can't wait to read this story! Very inspiring! Great interview! Can't wait to read your new book, Miranda! And congratulations on all your forthcoming books! This is great. Fingers crossed. Your new book looks awesome. Thanks for the interview and the giveaways, Miranda and Sylvia! "...people write their way to publishing contracts." Thanks -sometimes the obvious is poignant. Looking forward to these books! Another amazing interview! I am looking forward to reading. Fabulous interview. I am looking forward to reading your books. You are also a great of example of how getting out into the world and your comfort zone is inspiration for writing. Great information and can't wait to read this book! I can't wait to read this one and all of your new books coming out soon!! Congratulations! Thank you for being you, Miranda! You put your heart, soul, and true self into everything you do. You amaze me! Thank you, Sylvia, for this incredible interview! Miranda I enjoyed hearing about your journey. You write the kind of books I hope to write someday. I have preordered Water is Water and I can't wait to read it and your other books. Cant wait to get my hands on One Plastic Bag. Great interview. Thanks Miranda for all you do for our writing community. Thanks Sylvia for the interviews. Curious to know the word count in a Water is Water compared to One Plastic Bag. Excellent interview. Congratulations on your many successes, Miranda. One Plastic Bag looks like a lovely book with a strong message. The course sounds really good. I have to also mention that I love the statement that people write their way to publishing contracts. They don't network, pitch, or buy their way to them (ok, maybe some celebrities can). Sylvia, thanks for featuring Miranda and her books and course. And thanks to you both for the opportunity to enter for the fantastic giveaway. I look forward to reading your book Miranda. (books) I love the idea of ordinary people taking care of their environment and real women taking a lead in the great world wide plastic bag disaster we have created. I look forward to reading all your books, Miranda, and hope we will see more based on the experiences you had in Gambia. Thanks for the great interview, ladies. And congrats to Miranda! Wonderful interview, great prize. Your book looks and sounds wonderful. Congratulations and thank you. Sounds like a wonderful book! And so does Water is Water, which I got a sneak preview of from Jason Chin at an event at Bear Pond bookstore. Nice to "meet" a kindred soul! Perfect advice to write. Thanks Sylvia and Miranda. Marking my calendar for this one to come out! Thank you for a great post. :) T.
Wow, you are busy! I have a book about about an inanimate object that I'd love to sell. I' hoping one day an editor will fall in love with it. I can't wait to read your book and I love reading about other people's writing journeys. Thanks for sharing Sylvia and Miranda. I am looking forward to the book coming out! Wonderful interview - I always love to hear why writers write what they do. And also love what Miranda says about "breaking all the rules"! thanks to both of you for sharing the story behind the stories. Your book has now moved to the top of my reading list! Thanks for the fab post. Thank you so much, everyone, for the lovely comments and encouragement. As you can see, I'm three weeks behind in responding because I'm so busy. It's a good problem to have, but I want to make sure everyone knows how much I appreciate your support of this book. Because of those who will read/buy/share it, the women of Njau will get much exposure and the opportunity to flourish and change even more lives. Thank you!